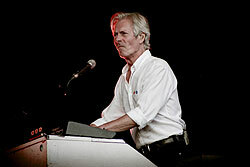 Andrew Bown, otherwise known as 'Acid Man' is the multi-instrumentalist of the band. Besides the keyboards, harmonica and guitar that you see him playing on stage with Quo, not many people are aware that bass guitar is his main instrument. Exclusive Magazine recently sat down with guitarist/keyboardist Andy Bown and asked him all about his past in Status Quo, their upcoming new album, his new solo CD, and, of course ... penguins! Taking it from the top and you first joined Status Quo in 1976 as cover on the keyboards - and yet some websites only have you credited as having become a "full-time member" in 1982! Do you take issue with that, perhaps? "Not at all. I was merely a hired gun at the time. After a couple of years I was told I could go for points but, still harbouring ambitions of continuing a solo career I never asked. When we reformed in 1986 however, that is when I became a director." So, for the record, and as you've been part of Quo for 35 years, did you ever think that this band would become your steady paycheck? "No. A long time ago Francis said it would, but I didn’t believe him!" Indeed, out of the years in Quo, what still stands out today as one of the true highlights of your Quo career? "Playing the piano introduction that opened Live Aid." It seems that Quo spend most all their time on tour, but in all its musical incarnations throughout the years - pop psychedelia, hard rock, boogie, progressive, commercial pop, etc. 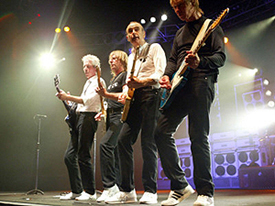 - which named tour in which year still stands as your favorite Quo tour to have been a part of musically - and why? "The Rocking All Over The World tour because it was my first full-time tour with the band. It was terrific fun and good money." Quo has under gone a fair few band member changes over the 30 years, but as you have been one of the constants, was there a time when you wouldn't get to know the 'new guy' for fear of him being gone soon thereafter? "No. Although Matt (10 years service) is still the nicest bloke I don’t know!" As we're not called Exclusive Magazine for nothing, please tell us a secret - one each - about both Francis Rossi and Rick Parfitt? "When you’re in a band there are no secrets!" The last Quo album was released in 2007, In Search of the Fourth Chord, but word has it a new album is due out this year! 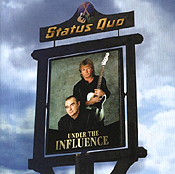 So, is 2011 the year for the new Quo album, and will it still be named Quid Pro Quo? "Yes, QUID PRO QUO will be released on Sunday 29th May." And, with that in mind, as there are other albums out there titled the very same - Kasim Sulton (2010), Breet Garsed and T.J. Helmerich (1992), etc. - does that ever come into play when an album is titled? "I suppose it should do but it doesn’t." With all those Quo albums under your belt, which one would you most like to listen to (from start to finish) if given the chance to sit back, kick back and laze around out in the summer sun? "It would probably be 'Under The Influence'." Talking about new albums for 2011, and word has it (again) that you yourself will be releasing a solo album, entitled, Unfinished Business. Is this true and if so, please explain what unfinished business you currently have? "Yes indeed. My first solo album for over 30 years, UNFINISHED BUSINESS, will be released on Cherry Red Records in September of this year - thus bringing that business to a neat and tidy finish." Which of all your co-penned Quo songs has reached the highest chart position - and what was the inspiration behind it? "Burning Bridges reached No. 2 and, when rewritten as a Manchester United song, reached No. 1. I was inspired when I overheard my daughter, Sophie, playing the Darby Kelly jig on her recorder." a) If I had a 7" of your single, 'New York Satyricon Zany,' how much would I expect to get for it if I put it up for sale at Sotheby's?! "About ten dollars!" b) By your own admission you claim to be the 'worst drummer in the world'! Man, that's a huge statement to make, let alone live up to. So, what makes you feel so damn confident in announcing such a bold statement?! "You really need to hear me play!" c) Your nickname is 'Acid Man' - something to do with the '70s, perhaps?! "Perish the thought! I was, at the time, credited with a razor-sharp wit and an ‘acid’ tongue!" d) Being a connoisseur of wines, and noted consumer of the same, what is your favorite wine to settle into an evening with - and can you kindly send me a box, perhaps? "A round South African red from the Thelema estate - and I never drink wine from boxes!" On stage you use a Roland RD-100 piano, a Hammond C3 Organ and a Roland D-70 synthesizer which are all connected to a Roland U-220, an E-mu Vintage Keys module, an Akai Sampler and a Leslie speaker - correct? "Correct. I have no idea, however, how to turn it all on!" Do you have any tattoos and, if so which is your latest one and where is it located?! "No." Lastly, and throwing you a journalistic curve ball, Exclusive Magazine love penguins ... do you, perhaps? "Delicious pan-fried with a little Tabasco!!"